It’s Ashley Horton here today. Did you know that we have another fun Mood Board to play along with this month? I used bits of inspiration from the board to create my layout. 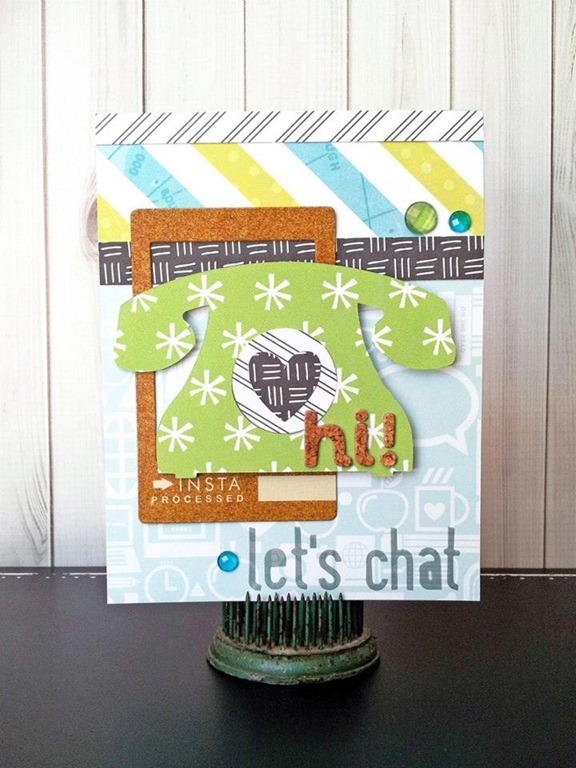 I loved the variety of colors, in the photos, from the Mood Board, so I used a mix of different color papers and embellishments from the April 2014 Hip Kit & Add-On Kits. There were two other fun elements that caught my eye…the stitched initials and the overlapping confetti. I cut each of the kids initials on my Cameo and then traced it onto my background paper. I used black and light green embroidery floss to stitch around the circles and initials. And I couldn’t resist using some of the sequins from this month’s kit, to recreate the fun confetti look! 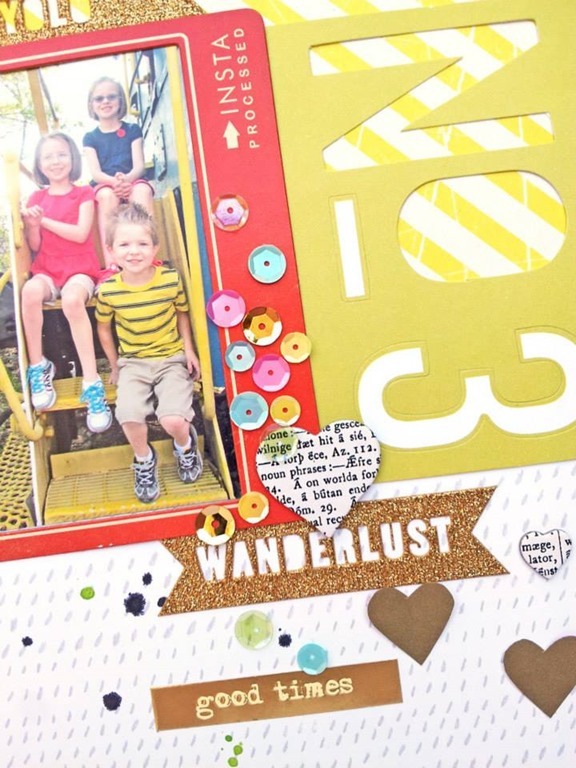 I really loved the Studio Calico icon patterned paper from the Wanderlust collection, included in our April kit. I knew it would make a perfect background for a “chat” card. 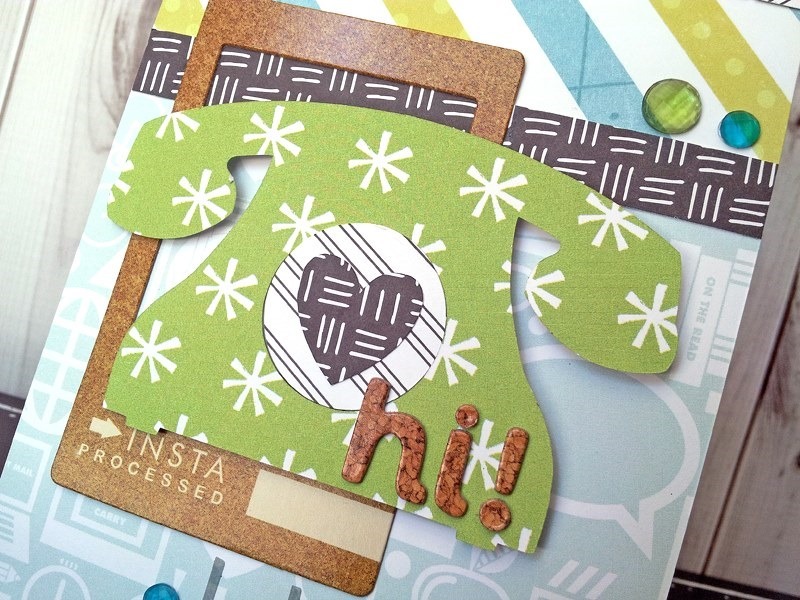 I spotted this cute rotary phone cut file in the Silhouette Store and cut it from the Amy Tangerine Plus One Buddy patterned paper. The Maggie Holmes frames are great for layering. I used a cork frame to coordinate with the American Crafts Scene Cork Thickers from our Embellishment Add-On Kit.